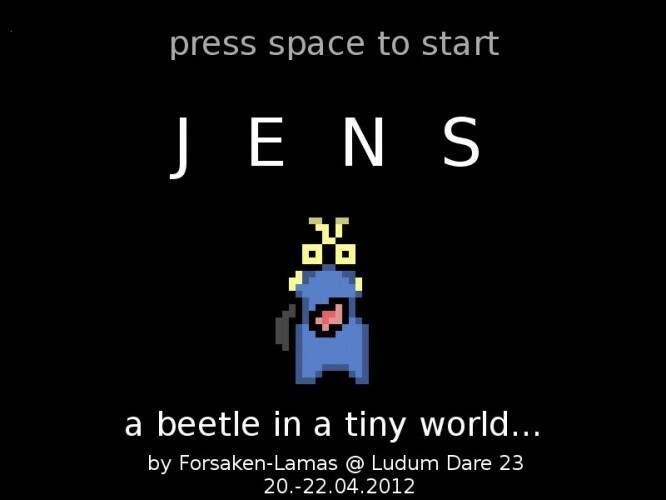 JENS - A Cute Beetle in a Tiny World. This is our (Forsaken Lamas) submission for Ludum Dare #23 Jam. It was our first parcipitation and we had a lot of fun while making this game. You are JENS, a cute beetle living in a tiny world. But someday a storm occurs and you're house gets destroyed. Now your task is to repair the house, so you can live in peace again. We provide a platform-independant jar-file. To run the game, extract all files into the directory of your choice and run "jens.jar". If this doesn't work, try to open it via "java -jar jens.jar" in the console. Have fun with our first tiny project! It works on the Mac, I was able to play with no problems. Nice game! If there's one thing you could do to make it better is to work on the collision detection for objects. It can be frustrating to not be able to walk in between things even though it looks like you can! Hope to see you coming back with more games! Great little start! I'd focus on working on the collision detection, as azurenimbus mentioned so that you can walk behind things. Other than that, I liked the text, with the different coloured words, the ability to check the stockpile, and the music. Thanks! Gah, crashed on startup in Ubuntu. Could you give more details about the crash? How do you start the game? Please try to start the game via console, if you didn't.